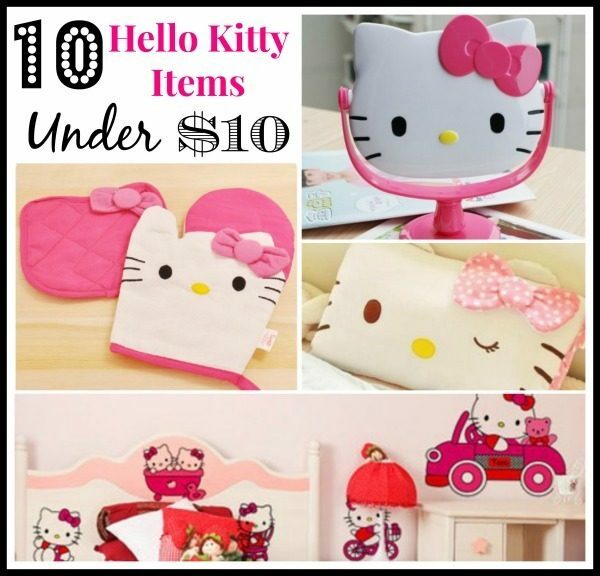 10 Hello Kitty Items Under $10! You are here: Home / Great Deals / Amazon Deals / 10 Hello Kitty Items Under $10! Any Hello Kitty fans here?? My daughter is a HUGE Hello Kitty fan, so I’m always looking for some good deals for her. And, of course, they have to be cheap! If you’re like me, you’ll love today’s roundup – we have 10 Hello Kitty items under $10 for you! Hello Kitty Ice Cube Tray – $5.98 + FREE shipping! Hello Kitty Trifold Wallet – $6.99 + FREE shipping! Hello Kitty Cookie Cutter – $2.85 + FREE shipping!